Home > Douglas Devananda > EPDP > feature > Politics > Rajasingham Jayadevan > Oh, Douglas Devananda! Where is your adventurous sailing to India! ( April 30, 2012, London, Sri Lanka Guardian) There was huge publicity on the claim by the paramilitary leader and the government minister Douglas Devananda that he will be storming Tamil Nadu with 5,000 Tamil fishermen from Jaffna to protest against poaching by the Indian fishermen in the territorial waters of Sri Lanka. Such a hyphened claim even attracted the worldwide media. One would expect the move to be executed ‘shortly’ to bring about ‘immediate halt’ of poaching as reported by the government’s nefarious and scrumptious media man K T Rajasingam. As claimed the protest voyage should have reached the shores of Rameswaram by now. 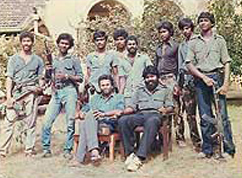 The news was highly pitched and adduced that the paramilitary leader Douglas Devananda was almost on the verge of leading the protest voyage. Days have passed and a week has gone and the much publicised adventure still remains a mission to be accomplished by the claimants. Browsing through the paramilitary EPDP website did not give any news or press release on the adventuress claim. A press release or an appeal for northern Tamil fisherman to join him would have indicated that the paramilitary leader is serious about his business. Since his hyphenated claim of 22 April 2012, he appears to be hibernating over his undigested local gourmet dosa without even a remark through his posterior. 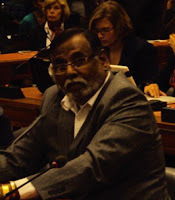 Even the modern day money laundering Sri Lankan obsequious and rogue Shylock of Helsinki is maintaining silence, since his hyphened claim of unaccomplished misdemeanour to his client Douglas Devananda who channels funds from his rogue businesses to whip up his hype. In weeks time, the paramilitary leaders claim would have lost its value and following that fully buried or cremated as it would have lost its news worthiness by then. Both the Shylock of Helsinki and the paramilitary bandit Douglas Devananda will be contemplating another hit story for their survival and to fatten their purses with their uncouth politics and deception.